One I'm struggling to get my head around, and hoping for some guidance/reassurance. Am I right in thinking that, if I was on a standard mentality with the default DL and LoE, to then select "more urgent" would mean that my players would be more willing to leave their default zone of pressing to help out elsewhere? So my AMC, instead of just closing down the DM area, would either move forward to help close down the centre back more often, or help a wide player close down a full back? The description in the ME seems to suggest "more urgent" means they will get to the player they're closing down more quickly. Surely the speed that players close down at is set mostly by some combination of their pace/aggression/determination/work rate? The issue I had last season in my Arsenal save was that, when I reduced the DL and LoE to the default for standard mentality, we scored more goals and had more space to play in, but I felt we were too easy to play through in midfield (4-2-3-1 wide, BWM(d),DLP(s), IF(s), W(s), SS(a)), and it was too easy for teams to get the ball out wide (and so we conceded too many goals). Do you think this is better solved by increasing the urgency and nothing else, or increasing the defensive line to aid compactness? I realise the answer is almost certainly "it depends on your players", but all things being equal, what you would do? Or to put it another way, which of the two would get us closer to the opposition more often without leaving them too pinned back and giving us no space to create in? I may be wrong, just an assumption. The line of engagement dictates the point to which the attack should retreat before trying to defend...once they are in their defensive 'zone' the pressing urgency takes effect in similar way to FM18... Low urgency should see them hold shape until an opponent gets quite close... And more urgency increases the 'radius' of what is considered close. I was delighted with the added option to the TC, i made a request for pretty much exactly this a couple of years ago. I dont think it quite happens in the ME yet... But i need to keep observing. I fully expect it to take another year or two of improvements before we really see the LOE work as it should. For my personal liking it still seems too interlinked with role and duty (possibly by design) but id like a striker in AF role, to tirelessly spearhead attacks and work the channel when i have possession, but still drop back to the LOE when we lose the ball...but currently AF is quite lazy at coming back and pressing and you can create almost a 50 yard vertical line between an AF and PF when defending... Doesnt feel like it should be that drastic. Well, you can always adjust the closing down, dl, loe during match, based on what you see. For example would you continue to defend the same way if you see the opposition attackers are always getting in behind your defenders or would you change sth if you see the opposition brings the ball out with ease and passes around you. Another thing is that as Arsenal, opponents would generally want to sit deep, because of the reputation, so there is an argument that you might not want to give the opponent time to regroup and come out - but it is not a rule, you might want something totally different. What I would say though is you should find out why you get pinned back, do you have an outlet to pass to when defending deep, how is your side's positioning, especially the holding players etc. Thanks for the reply. I feel like I'm really complicating things now, but if counter press is turned on, will the attack still retreat to that line? The line of engagement simply tells you how far your team is willing to let the opposition into your half before engaging. It does not tell the attack to retreat to a specific point. For example. You could tell your players to prevent short gk distribution and play with a low LOE but your strikers will still press the first to receive pass from the keeper. The LOE is a guide for your team. In a sense I can see why people would think they retreat..but its actually more subtle than that..its how far you are willing to let the opposition advance. So a high LOE means that you are not letting them advance from their own half, and extremely low loe will let them come all the way into your half. The LOE works in conjunction with defensive line and defensive width to set your overall defensive shape. All the elements work together. You can effectively create a low press, middle press and high press using the DL/LOE and you can also create what I am calling the Suicide Press. Here you have a low DL and a high LOE, Essentially telling your team not to let the team advance too high up the pitch, but concurrently also telling your own team not to go to far from goal. With some formations it can create zones on the pitch that are almost impossible to control for yourself. However they can also create some crazy attacking styles. Again basing on assumption.. No, counter press should see the team press the opposition ball carrier instantly... Presumably until the opponent has passed or dribbled away from that first press... Or x amount of time passes without having won the ball back. So far ive used counter press exclusively with high/highest LOE, though im preferring a lower line so im using regroup paired withe low LOE and medium urgency. @Rashidi I haven't played FM19, soon. I'm still playing a save with FM18, I assume it's not possible to recreate a high/low LOE there? Thanks. Not nearly as easily, its a lot harder in FM18 to do that, cos you would need custom closing down instructions on players. Not sure if it's the way Rashidi's worded his post or not that is causing the confusion but the Line of Engagement tells the team (forwards) at which 'point' you want them to start pressing. That's why you see the attacking unit move up and down. Then how aggressive they press is down to pressing intensity. Line of engagement is at what point you start pressing from. Urgency is how how aggressive you press the players once the line of engagement has been crossed. It's that simple. If you hover over the text in game, it tells you exactly what the settings do. I understand this – I guess my question, phrased more accurately, is what that "aggressive" means. I think I was under the impression that they would sprint more quickly towards the player confronting them, but I think it actually means is that they'd be more willing to leave their position to press. Line﻿ of engagement is at what point you start pressing from﻿. This is what i said maybe @Rashidi is onto something tho... Like a middle ground, because my observation is more in line with his statement... But logic of the screen, description is in line with our statement. It's all part of the same thing no? Urgency is FM is how aggressive you'll be towards them once the line of engagement has been passed. So the players will get closer to them much faster and hound them when the urgency is high compared to standing off them when it's lower urgency. The urgency is the urgency of the pressing/closing down, whatever you want to call it. You're both saying the same thing really. But the speed at which they get to them is determined by pace, work rate, determination more than it is urgency, right? Or do they all work together? Hence why I said it's all part of the same thing. Urgency is you instructing the player to be more aggressive in the press. More aggressive means pressing them earlier and hounding them. Less urgency would see the player press them much later in the move. Nothing more. How well the player follows your instructions, carries them out, and how good at it he is, all depends on the players attributes. I am pretty sure that's how it was explained to me, I will clarify this if I am mistaken, but from my observations in the game as well, the LOE is how far you allow the AI to advance before pressing instructions kick in. So if you are playing a high LOE you don't allow them to move very far before your team starts to press them, so if they have the ball in their third you start pressing them. So if you have a lower line of engagement you are telling your team to press them when they bring the ball further into your own half. You're saying the same thing as Westy, you're just both doing it from different ends. But still means the same thing. The quote on what it does is in the tactical changes sticky thread too, which Jack Joyce did with Herne. I guess the elephant in the room is; if you are playing 442... In your situation with low loe... What do you anticipate the strikers to do? Thats why i use the term retreat to loe... I dont see them just ignore defending, and if they just defend above the loe, then the loe is meaningless? Would lowering the defensive line help the strikers "retreat" rather than just LOE? Its too early for me to know any of this... So my thoughts are just a combo of what i think should happen (personal bias) and what i think the ui and descriptions show me... And some early observations. The ui shows the whole unit change slightly when you adjust the defensive line. So yes... I believe it will help bring the attackers back. Personally id rather see the two completely decoupled (so you could have a really tight squeeze around the halfway with high dline low loe...) its sort of decoupled... Like rashidi said you can set a high loe and low dline and create the two distinct units... With a big hole for the AI to exploit. It's likely to be number 3. When the loe is low, players only tend to close down when the opposition are very close to them. I've been trying high line and low LOE and haven't seen the strikers really drop back and like you say squeeze them in. Just resorted to H/H for now and box them in that way, hopefully. How deep your striker drops back is down to the role and duty used. You're not going to see your poacher playing in your own half because that's now what the role is about, even when out of possession. Defending compact and deep is a primary defensive focus though. It sounds to me like you want to use aggressive striker roles/duties but then want the benefit of them being really deep. You want the best of both worlds regardless of what roles/duties you use, which is unrealistic. Your roles and duties selection absolutely should have consequential behaviours to them. The absolute clarification on what loe does is in the tactical changes thread sticky at the top. It came from Jack Joyce from SI. I thought loe would kind of allow that sort of behaviour. Relying on role and duty, feels very much exactly what we had before... I dont see what the loe is achieving... Because as you said above (option 3) you would expect the strikers not to drop deep, but still press the ball if the opponent comes near them. What can i do now that i couldnt do previously, using the loe? Or is that the point its just a shortcut ti to low/high block to save using PI like previous? As an Arsenal fan... this match changed my thought process a lot, I will never forget this masterclass and the thrashing we got due to their superior tactics. Achieving it is easy enough on fm18 but thats using mentality, shape, duties primarily. Id hope loe would decouple it moreso. Just about to kick off a match so will add my setup... My reasoning, and some screenshots of my defence when the ai attack. You can help me sort it out! I am doing the same thing on FM19 with my Stalybridge side which is moving towards a 41221 that employs this style of football. I think there's a misunderstanding here. The player will play deeper but just how deep depends on the role/duty used. In the example above when I said the poacher wouldn't defend in my own half he won't. But he will be deeper than usual with a low loe. You can see this for yourself in any game. Use a low loe and you can see the positions he takes up in defensive situations clearly. Look at this, Leon Clarke is using a role and duty that naturally drops deep so takes up these positions constant. The other striker who is still in the opponents half doesn't drop back as deep because he is a poacher. Leon Clarke is a CF on support. The above screenshot is using a low defensive line and low loe. Clarke naturally drops deeper now and presses around the half way line/just inside his own area every go. Woodburn who plays as the poacher, doesn't press unless someone is close to him. Which makes sense as his role is aggressive in terms of positioning and what it does. In this second screenshot, Bloomfield has just headed the ball back to MacKinnon. Woodburn is close by but won't press him even though he can because he's not classed as being close enough to the player due to the low loe. He kind of backs off. Woodburn is playing above the loe because his mentality is much higher due to being an attack duty. However in this one, Clarke is busting a gut to press the player because the loe has been broken and his role is classed as playing deeper. So you can see how the behaviour of loe has impacted both strikers and how the support one is more willing to close down when loe is breached compared to the other striker who is considered past the loe starting point. Now when I use a higher loe, Clarke still drops back but nowhere near the amount he does with a low loe because he's more advanced and pressing at a much higher point. He's still as involved as he was before but now it's in different areas and more advanced than before. The Poacher is also now pressing much more aggressive too. On FM18 you couldn't instruct the player where the starting point is, that's the biggest difference in FM19 and what loe allows you to do, to set a starting point for pressing. The video you posted above, with the DL/LOE/Defensive width (which is probably the best option available) you can achieve lots of stuff you couldn't do on previous versions. Despite what people claim, you couldn't create different kinds of pressing systems on older versions. Now on FM19 you actually can. I'll be doing a proper in-depth guide about pressing and how to use defensive width and loe when I get the time. Despite what people claim, you couldn't create different kinds of pressing systems on older versions. Now on FM19 you actually can. The player will play﻿ deeper but just how deep depends on the role/duty﻿﻿﻿ used. In the example above when I said the poacher﻿ ﻿﻿wouldn't﻿﻿ defend in my own half he won't. But he will be dee﻿per than usual with a low loe. A guide would be great, i feel we have so much information on attacking (i know it was pretty much 95% of the content in my series) so now some articles on defending would be good...it definitely feels like more control is in our hands. @Rashidi any chance you could do a high, mid and low block guide for FM19 on youtube? Would probably help a lot of people out on using the new defending instructions. Basically in a nutshell you can set different pressing lines in the game now. You can even see these in the default tactical presets, have a look at each one of them and they are there already. Line of engagement - serves to tell your team when their defensive duties begin, however this works in concert with your defensive line. A high defensive line and a high LOE means that you are potentially doing a high press leaving acres of space behind you. A Low LOE and a low DL means that you are telling your team to drop deep and defend, and only start pressing in your own half. Generally you want to be tackling hard when you are playing a low press and stay on feet when you are doing a high press. Rationale is simple. When doing a high press your players are more likely to be chasing after an opposition player who has the ball increasing the chance of a tackle from behind. When you are playing with a low press or even a middle press there is a possibility that your players will face the player with the ball here they can afford to tackle hard. You can also create custom pressing styles which is currently my favorite way of playing. However here, we need to be careful., with role and duty allocation. Roles and duties play a big part in how your pressing works. All things being equal a wb is more likely to press earlier than a fullback, that's cos of the role and the inherently more attacking style the role is meant to play. Basically you can set any kind of pressing style, its entirely up to you. My high press could be someone elses middle press. It's been out of a while, I will make it public soon. I took the easy route in the video and just used the pressing slider. I will release one for custom pressing styles soon. 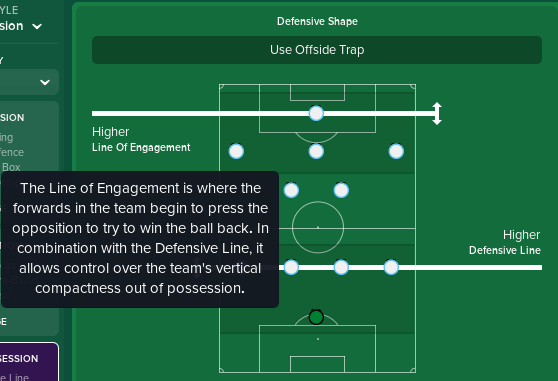 Don't know if anyone noticed when I was on twitch, I had my Dortmund side playing a middle press, high press and low press, I made a tactical preset specifically for that and just used the one tactic and changed the presets to chase a game or hold donw a lead. Maybe I should do it for Stalybridge from episode 4.
rafa benitez low line of engagement, low line of defense, higher pressing urgency. our team regroups into our half, this is the delay phase, then when the ball reaches the half way line with the centre backs the strikers start to press then the middle and so on as the ball advances through the transitions. jurgen klopp high line of engagement, high defensive line, high pressing urgency. the front three press high up the pitch into the opposition box, forcing mistakes, rushed passes into midfield/long balls. forward role and duty should not impact line of engagement. however it should impact how willing the player is to press and how far back they will go to press. In possession; pass into space - to use the attacking runs and make use of space created by our out of possession style. POD to allow us to get into shape, and players to start making forward runs. Play wide - stretch the opposition defence or give my wingers space. Transition : distribute to CB (in line with POD). Counter - bring the opponent out (with out of possession style) make most of the space with quick attack. Regroup - when we lose the ball, get back into a solid shape. Out of Possession: Low D Line, I just want my defence to be solid and safe, im not concerned about them being behind the play when we transition to attack, I don't expect them to be involved. Low LOE, in line with regroup I want us to defend deeper and encourage the opponent to leave space behind. Urgent press.... once they come to the halfway line... squash them and break quickly, don't allow the ball into the more technical players feet i.e. central playmakers. Roles… I still want my striker (poacher) to aggressively position himself, but by allowing the opponent to the halfway line, he will naturally come back and sit on the shoulder. TM on support to track back and defend, and try to play in the poacher and create space (by holding the ball and drawing defenders). Midfield 3 support duties to be involved in defence and then progress when we attack if the tempo allows for it. But primary focus is martialling the half way line for the press. Defence … could put FB on defend, but may be overkill with the deep line, so support should mostly keep them in defence, but offer an out ball on the occasion my wingers get held up. In terms of the match stats, limit the opponent to 4 shots, their goal was a direct FK. But the bigger picture, was us winning the ball frequently as they moved into our half. Our avg pos... nice cluster off the ball... if I change poacher to pressing forward it would definitely squeeze the opponent CMs out of the game. @BasedDarrenMoore when I copy this post to your thread it lost images. I added get stuck in and mark tighter, otherwise this is my go to 442 low block... I also change between tm/dlf/pf on support. I Try to understand these In a more simple way. The DL and LOE actually are the starting position of your players. A higher LOE means your forward players will stand higher up the pitch when not In possession. while higher DL means your defenders will stand higher both when you are In not not In possession. Urgent defines how likely the players leave their starting position to press the opposite. Did you find That the fluidity system disappear in 2019? It used to be an important concept In former versions. I believe now It is interprated In the DL/LOE settings. So suppose you want to play a structured, counter attack football, you can use higher loe and lower dl. Vice versa. I think It is easiear to understand compared to LOE the how far your forward retreat or how far you allow your opposite to push. Please point me out If any mistake. Yeah that's essentially what it is. Depending on the mentality of your attacking players you should see them dropping back behind this line as well. The LOE has a very cool way of operating, so if you know your overall mentality, and the roles and duties you have set you can even find players like Inside forwards dropping back to defend, which I think is absolutely fantastic. Which is why the CF drops back but the poacher doesn't in the example above. Because even though it can be slighly replicated through closing down instructions on players, it's not nearly as effective and dynamic as FM19. @Rashidi is it possible now to make the different pressing styles between Klopp's Geggenpress and Guardiola's High Press? Are they realistically represented in your opinion in the presets for Geggenpress and Tiki-Taka? I think the difference is shown only as one having tight marking and harder tackling (Geggenpress). Changed my mind about posting this. Oops. Thought I might address my queries here regarding counter press versus regroup. To date, I have had some success recreating an Atletico style low block press. Using a low def line, low LoE and a more urgent press I am seeing good defensive actions in my own half, with us conceding the wide areas and pressing aggressively once they enter our own half using the touchline as a 3rd man. I obviously have counter selected for transitions but when possession is lost I have so far been rocking counter press but have been considering regroup. The exam question is what effect does the LoE have on the counter press instruction? With a low LoE, if I lose possession in the opponents half will my team try to win it back, and if so for how long before they back off? Surely with a low LoE and counterpress, I get the benefit of an immediate press if I lose it in the opponents half but still have some of my players retreating back to only press if the opponents make it to my half. Equally if I select regroup, if when retreating my player is in close proximity to an opponent as they counter, will they press them as I have a more urgent press selected? I have to say so far the results have been pleasing but this final piece would be interesting to nail.